Can't find anything on this. I call bogus. Last edited by bodyelectric; 02-21-2019 at 03:41 AM. The Roadmachine 20 is not there. Leak? Maybe but being 13Mar and with races coming you'd think the model was already approved for racing if they decided so. 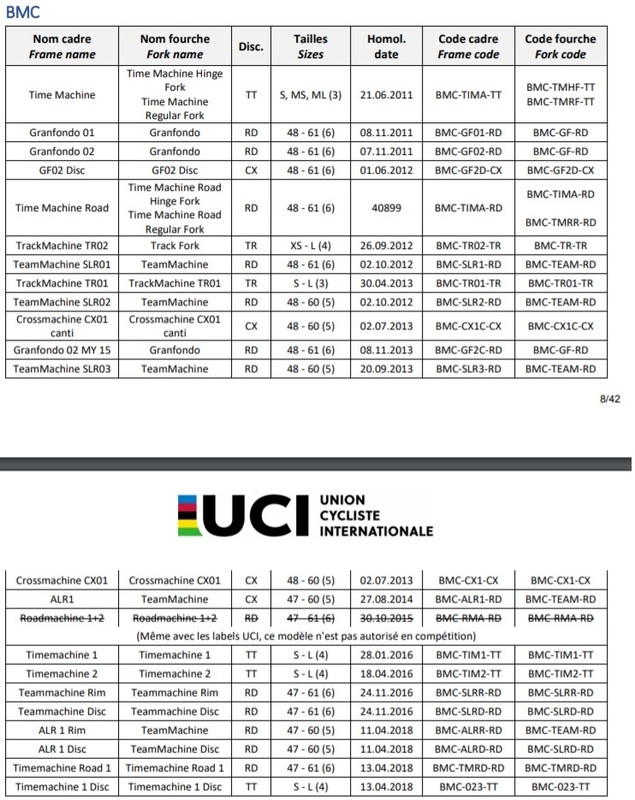 Apparently Dimension used the Teammachine at Strade Bianche unless this new RoadMachine 2.0 is homologated (again?) before the cobbled classics. Still, being a 2016 model, it's starting to get long in the tooth. I want one, though! Dimension Data raced Teammachines at Strade Bianche, but then again you cannot really compare that race to Paris-Roubaix. Last edited by bodyelectric; 03-13-2019 at 01:45 PM. Dimension Data raced Teammachines at Strade Bianche, but then again you cannot really compare that race to Paris Roubaix. We would be seeing good deals on Roadmachines already but at least in Australia, that is not the case. They're still going at full pop mostly. We would be seeing good deals if people knew a new model is coming up and hang tight. But just like the fools they are, they rather trust corporate marketing than clear evidence and common sense. 2019 02 frames come with a new ICStem that can be put on pre-2019 02 frames as well. This stem is actually very similar to the old ICStem for 01 frames, but my LBS told me the internals are a bit different to prevent creaking with round-steerer fork. So yeah, it looks like you can retrofit just the stem and the appropriate carbon top cone to your 2018 RM 02. Note that you still won't have full internal cable routing. For that, you'll need the ICFork as well. Please double check this with your LBS. Just ordered a fork from the rm01 for my 02. Excited about being able to run the cables internally. Another dumb question, where exactly does the di2 internal battery fit into the rm02? Can it fit in the seat tube? Just because of the odd shape of the seat post I assumed maybe it wouldn’t fit in there..
Yeah you need the flat sided fork as well otherwise wont be any use to you. Ya, good to know. Thnx. Anyone have a link on a place that sells the rm01 low top come from 2017-2018? They’re sold out online but I guess my bmc dealer will have some laying around. I don't have Di2 installed on my 02 nor have 01 fork for internal cabling. But it's same as 01, inside the seatpost. In fact, 01 and 02 share the exact same seatpost. And that's where the battery goes in all models. yup.. just pull the seatpost to verify. Should be a hollowed out foam, the battery screws into the foam. 09Apr... 5d before Roubaix no Roadmachine on the UCI approved list... yet. Dimension Data rode Tour of Flanders on Teammachines and Timemachines. But then, Specialized just released the new Roubaix... which is not on the list as Approved but the pictures seem to have a UCI sticker on the bike. So, I was wrong. Dimension Data raced Teammachines on Sunday. Also, the new Specialized Roubaix has been approved as "ROUBAIX MY20" on 27.09.2018. Last edited by bodyelectric; 1 Week Ago at 12:31 PM. There is a new bike coming from BMC. I'm not clear on whether it will be a new RoadMachine or something else. I was told it will be a platform suitable for some gravel. Not much in the way of details though ( release date, other details). Last edited by Finx; 2 Days Ago at 12:24 AM. Not everyone has been using their endurance bikes. Canyon riders are on Ultimates and Aeroads (on cobbles!!!). Van Der Poel is racing with his Aeroad. Endurace's nowhere to be seen. Van Avermaet was on a previous generation Defy (the one that is lighter with an integrated mast). My guess is that Endurance bikes are not a thing in the peloton anymore thanks to disc equipped racing bikes that are just compliant enough. Exception made for Specialized and Pinarello that are pushing something very specific. The Roadmachine is up for a revamp at any rate, so you are not wrong. Something must be coming.